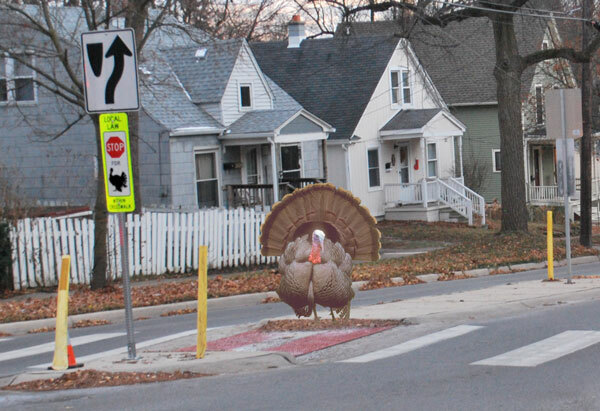 ﻿ The Ann Arbor Chronicle | Column: Why Did the Turkey Cross the Road? Column: Why Did the Turkey Cross the Road? The remarkable coincidence of Chanukah and Thanksgiving this year hardly compares with the once-in-a-lifetime opportunity to combine a standard child’s turkey joke with a change to a local crosswalk law – which will be considered by Ann Arbor city council at its post-holiday meeting on Dec. 2. In broad strokes, the Ann Arbor city council first enacted a local crosswalk ordinance in 2008. The law was supposed to explain how motorists and pedestrians should interact at crosswalks. In 2010 the council modified the law, and in 2011 gave it a further tweak. After those revisions, for the last two years, Ann Arbor local law has differed from the Uniform Traffic Code (UTC) rule in two ways. First, under current local law, motorists in Ann Arbor are supposed to yield the right-of-way to those pedestrians not just “within a crosswalk” but also to those who are “stopped at the curb, curb line or ramp leading to a crosswalk.” Second, when driving toward a crosswalk, motorists in Ann Arbor don’t have the option to yield to a pedestrian by merely slowing down; instead they’re required to yield by stopping. The proposal the council will consider for final approval would scrap the whole section of the city code, reverting to a reliance on the UTC – which allows slowing for pedestrians, stopping only when necessary, and does not apply to any pedestrians other than those within a crosswalk. A council majority of six members is currently supporting the repeal – Sumi Kailasapathy (Ward 1), Jane Lumm (Ward 2), Sally Petersen (Ward 2), Stephen Kunselman (Ward 3), Jack Eaton (Ward 4) and Mike Anglin (Ward 5) – with five of them sponsoring it. According to sources from both groups, backchannel discussion has included the possibility of a compromise on Dec. 2 that would leave in place the requirement to stop, but would still confine the motorist’s responsibility to yield to just those pedestrians within the crosswalk. The regular city council Sunday caucus has been shifted from 7 p.m. to 1 p.m. to allow for better attendance to discuss the crosswalk ordinance. Given the historical background of the 2010 change, I’m not sure that the compromise solution makes much logical sense. And I think that the current words on the page – which extend the right-of-way to pedestrians at the curb – more nearly reflect the kind of community to which we should aspire. But that sort of compromise might offer a chance for us as a community to stop (not just slow down) fighting about words on the page and to give full gas to education and enforcement. And I’m for that, especially in the context of the pedestrian safety task force that the council established on Nov. 18. Members of the task force will be appointed at the Dec. 16 meeting based on applications received by Dec. 2. This sort of “compromise” could serve the same function as gravy at a Thanksgiving dinner: You load up a plate of turkey, stuffing, mashed potatoes, cornbread, and then, when the green bean casserole is passed your way, you take some of that too, because Aunt Dorothy (rest in peace) is looking right at you and it’d be impolite to refuse, even though green bean casserole is flat-out gross, so you ladle that “compromise gravy” over that heap of food, you clean your plate, and everybody can focus on the task at hand – which includes talking about how good everything tastes. Based on those reports, I don’t think it’s possible to draw conclusions about any impact the current ordinance might have had on safety – good, bad or indifferent. But a lot of insight from these reports can be gained that might help inform the task force’s activity as they work toward a February 2015 deadline for delivering recommendations to the council. For readers who are not familiar with the joke answer to the question posed in the headline of this column, it’s provided below. 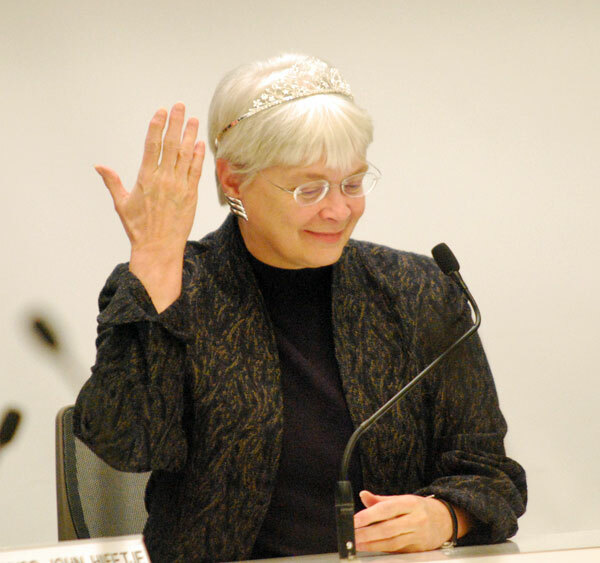 That punchline follows a more detailed history of the local ordinance since 2008, several colorful charts and graphs, and a photograph of former Ward 4 councilmember Marcia Higgins wearing a tiara. What Does/Did the Law Say? (a) When traffic-control signals are not in place or are not in operation, the driver of a vehicle shall stop and yield the right-of-way to every pedestrian approaching or within a crosswalk. (a) No pedestrian shall cross a street at a location other than at a crosswalk into which vehicle traffic is then restricted by a traffic control device unless such crossing may be done safely and without interfering with motor vehicle and bicycle traffic on that street. (b) No operator of a motor vehicle or bicycle shall interfere with pedestrian or bicycle traffic in a crosswalk into which vehicle traffic is then restricted by a traffic control device. (c) When traffic-control signals are not in place or are not in operation, the driver of a vehicle shall yield the right-of-way, slowing down or stopping if need be to so yield, to a pedestrian crossing the roadway within a crosswalk when the pedestrian is on the half of the roadway on which the vehicle is traveling or when the pedestrian is approaching so closely from the opposite half of the roadway as to be in danger, but a pedestrian shall not suddenly leave a curb or other place of safety and walk or run into a path of a vehicle that is so close that it is impossible for the driver to yield. When traffic-control signals are not in place or are not in operation, the driver of a vehicle shall yield the right-of-way, slowing down or stopping if need be to so yield, to a pedestrian crossing the roadway within a crosswalk when the pedestrian is on the half of the roadway on which the vehicle is traveling or when the pedestrian is approaching so closely from the opposite half of the roadway as to be in danger, but a pedestrian shall not suddenly leave a curb or other place of safety and walk or run into a path of a vehicle that is so close that it is impossible for the driver to yield. Every pedestrian who crosses a roadway at any point other than within a marked crosswalk at an intersection shall yield the right-of-way to all vehicles on the roadway. In the summer of 2010, when the council was asked to contemplate revising the ordinance, the focus was not on the manner in which a motorist was supposed to yield to a pedestrian (slowing versus stopping). The focus was entirely on which pedestrians should trigger the yielding behavior. One of the differences between the 2010 version and the 2011 version was that in 2011, the set of pedestrians that motorists were required to accommodate was reduced – to just those on the half of the roadway where the motorists are traveling. (a) When traffic-control signals are not in place or are not in operation, the driver of a vehicle shall yield the right-of-way to every pedestrian approaching or within a crosswalk. So how did that wind up getting changed to “stop and yield”? On Nov. 7, 2013 – at her final meeting representing Ward 4 after 14 years serving on the Ann Arbor city council – Marcia Higgins donned the tiara presented to her by her colleagues. The UTC language includes the word stop, but with a hedge: “… slowing down or stopping if need be to so yield.” So if the compromise is to retain the requirement to stop – but remove the language that extends the right-of-way to pedestrians other than those who are within the crosswalk – then the compromise wouldn’t address the main concern that pedestrian advocates had back in 2010. They had not objected to the inclusion of a requirement to stop, but that’s not what they’d advocated for. They had mainly wanted motorists to yield the right-of-way to pedestrians before pedestrians enter the roadway – no matter what side of the road a pedestrian is standing. A recent study on the effect of rapid flashing beacons and HAWK signals, conducted by Western Michigan University, documents that motorists dramatically increase their compliance when some type of flashing beacon is activated. So I think it would be useful to move ahead with judiciously placed flashing beacons at additional locations in Ann Arbor. But that same WMU study documents the generally abysmal stopping rates in several locations across the state, including Ann Arbor. 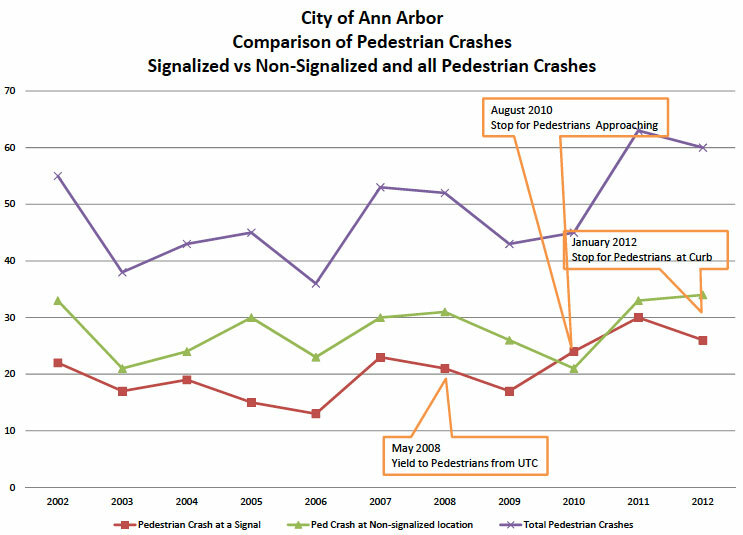 And the study documents that Ann Arbor motorists are somewhat more befuddled by some of the pedestrian safety signals than motorists in other places. 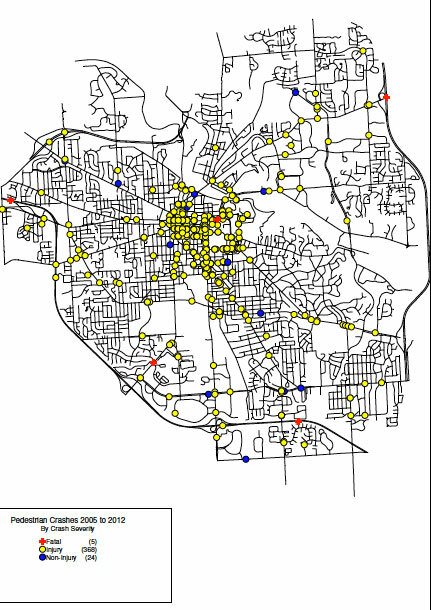 For example, when confronted by the solid yellow phase of a HAWK signal, 31.13% of motorists in Ann Arbor were “unsure” what to do, compared to just 8.62% of motorists near Wayne State University who were unsure. [.pdf of WMU study] So we certainly have room for improvement on the educational front. I think some kind of compromise on the repeal might be the most efficient path forward toward additional flashing-beacon type infrastructure and a unified educational and enforcement campaign that we can all support. So even though the possible compromise does not make logical sense to me – and even though I think that since the limited enforcement campaign associated with the ordinance change has already led to more frequent accommodation of pedestrians by motorists (making it easier to get around town by foot) – at this point I’m not inclined to participate in a food fight. Instead I say: Pass the compromise gravy. 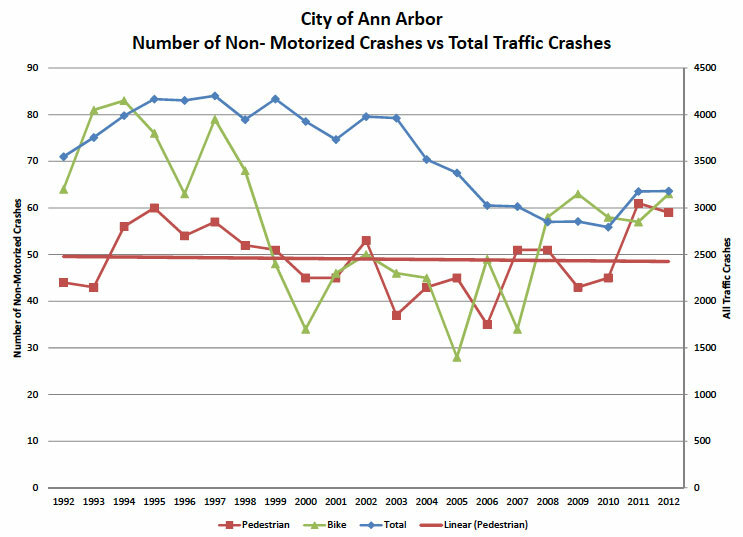 And I’d invite you to check out the charts that city staff have compiled, in many cases pulling data from Michigan Crash Facts. One general caveat is that unless indicated explicitly otherwise, a pedestrian crash is just a traffic crash that involves a pedestrian – which includes those crashes at a crosswalk, not at a crosswalk, at an intersection, or not at an intersection. It’s not surprising to learn that the distribution of pedestrian crashes skews toward the late afternoon and evening hours, when people are out and about, and traffic is heavy. That’s the plot reflected in the overall height of the bars in Chart 2 below. What is possibly a little surprising is the proportion of those bars between 5 p.m. and 7 p.m. that’s accounted for in November (yellow) and December (red). It’s possible that might be related to the change in light levels and the transition from Daylight Saving Time. 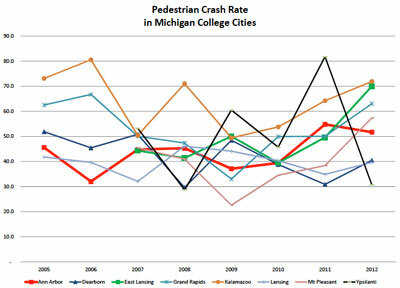 Michigan college cities, shown in Chart 4, show a lot of variability. 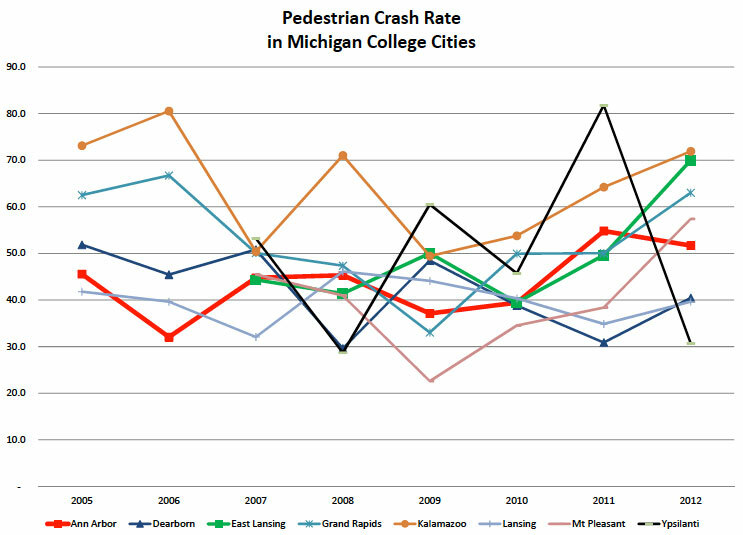 But from 2011 to 2012, all cities included in the chart – with the exception of Dearborn (which showed a dramatic decrease from 2011 to 2012) and Ann Arbor – show an increase in numbers of pedestrian crashes. For the longer period, East Lansing and Ann Arbor show a similar, somewhat upward trend. 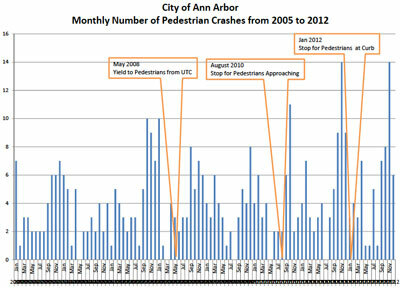 As a percentage of all crashes, pedestrian crashes in Ann Arbor show an upward trend – starting in 2003 (Chart 5 below). Data from other college cities nationwide appears to be gappy, but a similar upward trend over the same period doesn’t seem to be attested. Madison, Wisc., for example, shows a slightly downward trend over that period. 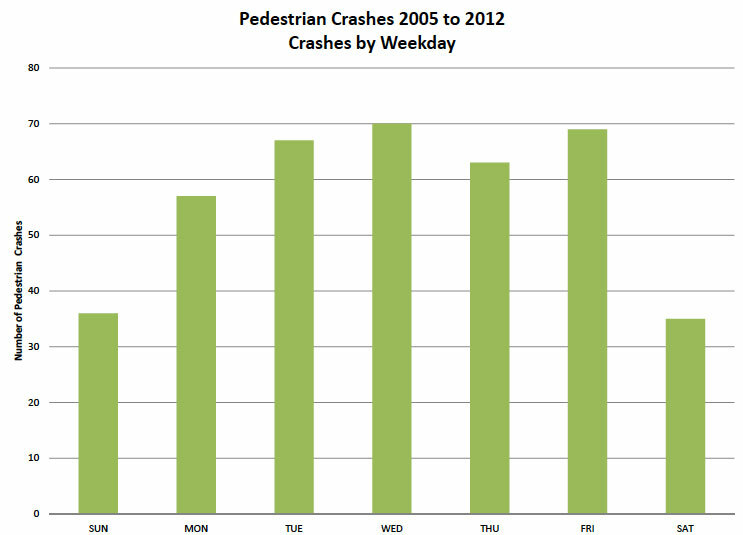 As a percentage of all crashes, pedestrian crashes are trending upward. And that’s due to the fact that the raw numbers of total crashes (blue in Chart 6 below) are trending down, while raw numbers of pedestrian crashes (red in Chart 6 below) are trending only slightly down, over a 20-year period. 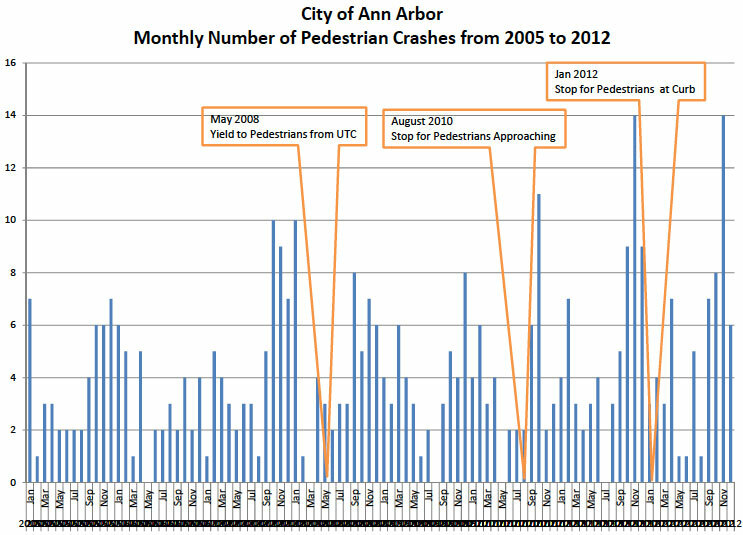 Tracking Ann Arbor pedestrian crashes by month (Chart 9 below) reveals that in the last two years, the increase includes a clear spike in November of both years (14 pedestrian crashes in each of those Novembers), exceeding the monthly total of any other month in the last eight years. 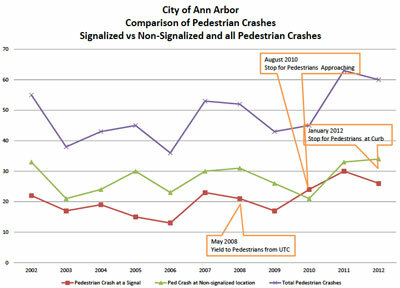 Comparing pedestrian crashes in Ann Arbor at intersections to pedestrian crashes at other locations shows a clear upward trend for crashes at intersections (red in Chart 10 below), but only a slight upward trend for pedestrian crashes at other locations (blue in Chart 10 below). Comparing the pedestrian crashes at signalized versus non-signalized locations (Chart 11 below), it looks like a wash to me: A somewhat upward trend over the last eight years for total pedestrian crashes appears to be reflected in similar trends for signalized locations compared to non-signalized locations. Punchline: Because he wasn’t chicken. Happy Thanksgiving you guys! Love the graphs and maps. What’s the r-squared for the trend lines in Chart 10? I don’t understand why this is so complicated. The Crosswalk Ordinance is a (fatally) failed experiment. Every 7-year-old understands “Stop on the red. Go on the green. Don’t get caught by Mr. In Between.” The best way to protect pedestrians is an unambiguous red-yellow-green traffic light. Ticket drivers who don’t stop and pedestrians who cross in the middle of the block. How many pedestrians have to die before we stop compromising? There is no room for compromise in a collision between a pedestrian and a 2,000 pound car. 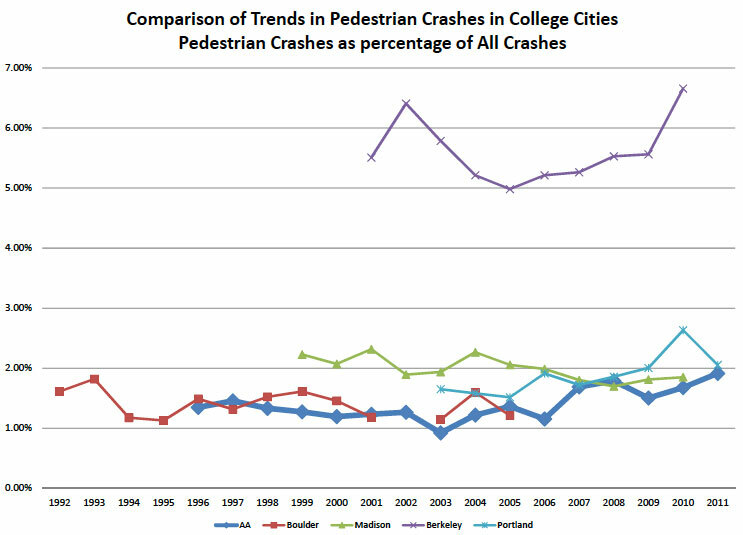 Another 3,200 word scholarly article complete with charts and graphs and statistics will not save one pedestrian’s life. 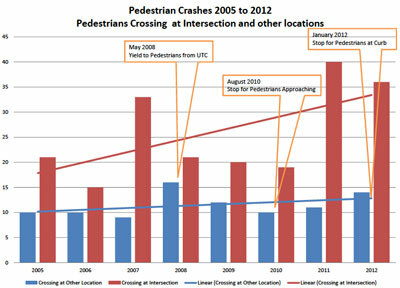 - the ease (i.e., length of wait) of crossing streets by pedestrians vs. the safety level of crossing the street. - the ease of crossing relative to past years. I think Dave’s graphs addressed that relative to safety. 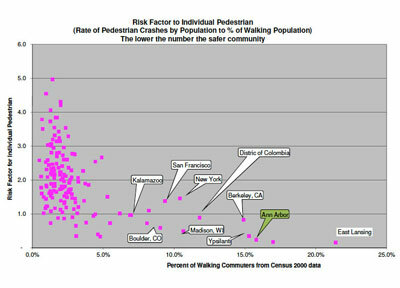 Are there more pedestrians than in the past and therefore more of them that are waiting? 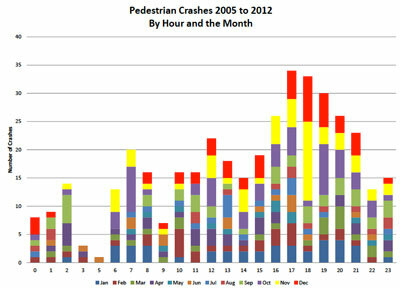 Is there more vehicle traffic than in the past and so longer waits to cross by the average pedestrian? Or both? - the difference in ease and safety of crossing for two-lane streets vs. three-or-more-lane streets, and whether there are more or fewer of the latter now than in the past, and how that relates to the questions above. - Where/when are drivers supposed to stop? At the crosswalk or some distance before that? As soon as they see the pedestrian or not until they get to the crosswalk? What if the pedestrian has crossed by the time they get there? Do they still need to stop? Drivers should stop cars at the stop bar – a thick painted line some feet before the crosswalk. These stop bars are in place at all 4-way stops, all signalled intersections, and many marked crosswalks. They are certainly present at all of the crosswalks with RRFBs (rectangular rapid flashing beacons) and the HAWK light. Stop bars should be placed to provide visual clearance for the crosswalk – so drivers behind can see the crosswalk and know a pedestrian has entered it. That’s what the books say. If the RRFDs are blinking, but no pedestrian is in the crosswalk, cars may proceed through. If the HAWK is red or blinking red, cars should stop. I think measuring ‘ease’ may be more subjective than objective. Each crosswalk would have to be evaluated on some scale – and there are thousands of crosswalks at uncontrolled (no signal, no stop sign) intersections. The number of pedestrians (where?) might be equally hard to measure. Some places, such as near campus, clearly indicate many pedestrians. Other areas (such as Plymouth Road) show an increase, perhaps due to an increase in off-campus housing in that area. Others (such as Washtenaw) also show an increase, perhaps because the shared path on both sides creates an opportunity to safely walk. And shopping on both sides of Washtenaw creates an rationale for crossing the street. The solution you seem to want is a change in engineering/infrastructure – put stop lights at all mid-block crosswalks and at all intersections around town. Is that the idea? I would prefer my city council reps. display an understanding of the fundalmentals of an issue rather than going round and round in a mire of detail. A major downside of this is that others, including the public, get caught up in the whirlwind, resulting in a ball of confusion. serve as an elected official by directing a process where professional staff do the analysis and recommend solutions for council to deliberate? What happened to standard operating procedure? There are interesting articles relevant to this discussion in the new weekly paper, The Independent. One place I’ve seen it for sale is Book Bound, a new local bookstore off Plymouth Rd., near Cardamom restaurant. Over the last few years Ann Arbor readers have had the opportunity to read thousands of words about crosswalk ordinances and laws. However, we have not heard a single statement from a Professional Engineer (P.E.) with traffic engineering expertise. Why? The city of Ann Arbor employs Professional Engineers, as do most cities, counties, states, countries and transportation agencies. In Michigan, Professional Engineers are licensed after earning an engineering degree, working for 4-years and passing a rigorous series of exams, as outlined here. [link] Given these requirements, why do so many individuals in Ann Arbor believe they are qualified “to practice” as a Professional Engineer? Do they believe they are equally qualified to practice medicine, or give advice as a certified social worker or CPA? “In Chicago, some intersections are being adorned with sophisticated electronic devices. At others, simple crosswalk-specific stop signs are displayed. The city’s new transportation director, Gabe Klein, has observed motorists at one such intersection near his downtown office. He said he’s been surprised by the results. ‘The people that come through here every day, they just know to stop. And that’s how you make cultural change,’ he said. But those same signs seem to be having the opposite effect along busy Ogden Avenue in Western Springs, where officials have noted an increase in vehicle crashes where a new flashing light and sign system is being tested. Dave also states, “And I think that the current words on the page – which extend the right-of-way to pedestrians at the curb – more nearly reflect the kind of community to which we should aspire.” Realizing a goal usually requires years of hard work and a major investment, not a God-like proclamation like the local crosswalk ordinance. If we aspire to be a more pedestrian-friendly and pedestrian-safe community, let’s consult with the experts (P.E.’s) and develop a strategy for achieving our goal. Issues that are never addressed when discussing this ordinance are 1) Bicyclists, and 2) pedestrians being expected to take some responsibility for their own safety. The ordinance itself places responsibility of Crosswalk safety strictly on motorists. My biggest objection regarding the ordinance lies with that point. How do we educate the Pedestrians and Bicyclists about the responsibility that they share when we enact such an ordinance? People ramble on about enforcement, or the lack of; apparently not understanding that this type of ordinance is quite unique. In particular is the fact that many of the pedestrians themselves violate the ordinance out right. Bicyclists do not appear to follow any laws, they weave dangerously in and out of marked traffic lanes, and plow through the crosswalks running stop signs and red lights. On more than one occasion I have witnessed collisions between a bicyclist and pedestrians. I have especially around U-M’s Central Campus watched as pedestrians just wander into the street in front of moving traffic without warning causing collisions and near misses alike. Several years ago the AAPD started to ticket bicyclists for not obeying traffic laws, this lasted about 24 hours and then ceased because the bicyclists started to complain about being ticketed. With all of my grumbling, I feel that until we can gather an understanding among motorists, pedestrians and the bicyclists that it would be safer to just rely on the UTC for the crosswalk regulations. Inclusion of that next sentence would have followed the example set by Chuck Warpehoski (Ward 5) during deliberations on Nov. 18, when he was quoting from the Federal Highway Administration guide on developing a pedestrian safety plan – and he observed that it would be remiss of him not to include the next sentence after the passage he was quoting, which indicated that legislative efforts should begin on the state level (a point that tended to work against the point Warpehoski was making). Also I don’t agree with your implication that expressing support for the installation of additional “judiciously placed” flashing beacons shows a lack of deference to experts. Indeed, I quite consciously chose to insert a phrase (“judiciously placed”) that I thought would efficiently convey that the location of the devices should be informed by the usual city process of review by city staff, consulting all the relevant documents including the city’s non-motorized plan, which identifies general locations where additional such signals could be installed. Your position appears to rest on a claim that none of the city staff involved in those types of decisions have sufficient professional qualifications and certifications to venture an opinion on these matters, let alone anyone else in the community. I respectfully disagree on both counts. I also don’t think that calling local ordinances (of any kind) “God-like proclamations” helps the conversation along in a positive direction. I’ll wrap up by returning to the main point of this column: I’m more interested in the work that we as a community might do together to improve the way motorists and non-motorists interact out there in the real world than I am in trying to win an argument about which words should be on the page. It’s not as if PEs have been absent from the discussion. They were in the middle of creating the unsafe, dysfunctional road network that exists today. What evidence do we have for the idea that they are going to make matters better? As a recent transplant to San Francisco from Ann Arbor, I am still busy, as a driver, remembering to constantly check for pedestrians at intersections, which do not have traffic lights. I appreciate all the drivers who stop for me when I cross at these intersections. This seems to be part of California culture so it probably is behavior that can be learned even in Ann Arbor. The pedestrian habit of wondering across the streets anywhere just doesn’t exist. I did it once, bad AA habit persisting, and was roundly chewed out my fellow citizens. Thoroughly shamed, I learned my lesson. One point which may be relevant to your comment is that most fields of study are always evolving; engineering is no different. Experts? Never trust the “experts” to make important decisions. Our culture is littered with failed enterprises based on expertise. Nuclear power is one example. Remember how the “experts” kept telling us it was safe? 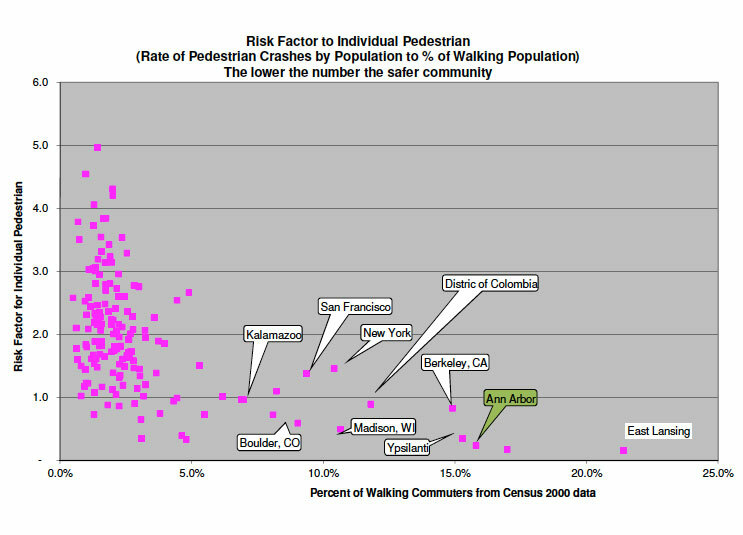 Also, with regard to the crosswalks, the data show no correlation with anything. Ergo, there is not much for an “expert” to latch onto. @#9 P.E.’s were not involved in the discussion and did not issue a report on any version of the local crosswalk ordinance. Dave Askins has provided an excellent chronology, including the relevant statements at the last Council meeting. Please keep in mind that Steve Powers was hired in late 2011 and Eli Cooper was the staff spokesperson when council revised the ordinance shortly after Powers’ arrival. Complicating the issue is that the state UTC, not the local ordinance, applies on the UM campus and the AAPS follow the AAA school safety patrol program guidelines. P.E.’s were involved in the UTC and the AAA guidelines, but not the local ordinance. Regarding evidence for improvement in the future, Council adopted the Complete Streets law and can ensure that the city staff, including the P.E.’s, work within this framework. In addition, many more pedestrian advocates are now involved in the process. @#13 Would you fly on a plane or cross a bridge designed and built by citizen advocates rather than engineers? Citizen advocates, such as those to serve on the Pedestrian Safety Task Force, may play a valuable role if they collaborate with others, including P.E.’s. When crash statistics are limited or inconclusive, the National Highway Traffic Safety Administration (NHTSA) recommends evaluating crash sites against best practices – signage, lighting, sight-distance, and law enforcement. (b) In front of a public or private driveway. (d) Within 15 feet of a fire hydrant. Ann Arbor does not consistently enforce this law and has placed parking spots within 20 feet of a crosswalk on one-way streets. There is much for the “experts” to do — if empowered by our city leaders. Let’s agree on a process for improving pedestrian safety that is inclusive, based on best practices and adequately funded. Glad you mentioned bridges, Kathy! Remember “Galloping Gertie,” the bridge that collapsed in a high wind? Or other bridges that were supposedly earthquake-proof but have departed this life, taking other lives with them? I wonder if there would have been greater acceptance of this ordinance if it had come out of the community, after discussion, rather than appearing as a Diktat from a pretty limited segment of the community (i.e., The Council Party). Top-down, social-engineering ideas tend to create much resistance on the ground. Who knows? Had this idea come from an impulse to self-government, it might not have aroused the ire of so many people. As a pedestrian, a cyclist, a driver, and a parent, I share the above observation that non-motorists (particularly those under 25), seem surprisingly (unwisely?) willing to put their lives in the hands of strangers. At one level, this trust in Humanity is touching; at another, it seems to me not to be in the spirit of sharing the road, which suggests (again, at least to me) some sense of mutual obligations on the part of road-shareres. It is a small irony that the part of town where pedestrians & drivers seem to have the most conflict is exactly the part of town that was laid out when walking was how most people got around town. Whatever one thinks of traffic engineers, they didn’t lay out “The Charm Zone”. RE: 14, the Federal Highway Administration also suggests the use of citizen pedestrian safety committees in cooperation with expert feedback. To include one does not preclude the other. re: #16, also downtown is where we have the highest numbers of pedestrians, so I’m not surprised that it is also where there are the most pedestrian crashes. It would be interesting to slice the data by injury rate. I would imagine that the lower average speed of downtown traffic also means a lower rate of injury per crash. >>The solution you seem to want is a change in engineering/infrastructure – put stop lights at all mid-block crosswalks and at all intersections around town. Is that the idea? Yes. The current approach is confusing to drivers and, therefore, dangerous for pedestrians. 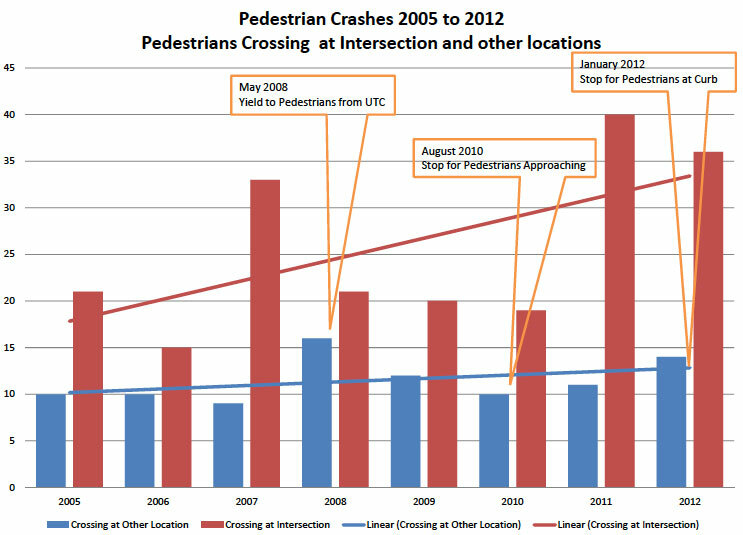 If our objective is to maximize pedestrian safety, then use a clear and unambiguous signal that drivers must stop. Of course, that will slow traffic, but that’s what we are doing now. @4: I was referring to non-signaled, mid-block crosswalks, not those at intersections (which vehicle stoppage isn’t triggered by pedestrians but rather signage or signals) or the signaled ones. Those crossings don’t have the stop bars. re: #18, most of the places we have other treatmens such as the HAWK signals or RRFBs are not eligible for red/yellow/green traffic lights. There might be some that are, but my memory is that at the last meeting Craig Hupy said that most of the ones are not. The folks on 7th Street have found out about these regulations the hard way in their efforts to get a stop sign or stop light at 7th and Madison. City staff have explained that traffic patterns there do not fit the standard for an all-way stop sign or traffic light, and if the city were to install one that does not meet the standards, the taffic engineers could be held _personally_ liable. Chuck, if you slice the data by injury severity and speed limit, you get the expected result that higher speeds are more likely to have more severe injuries than lower speeds. That holds both for Ann Arbor crashes as well as for a broader look at data statewide. It was less of an effect than I expected, and incapacitating injuries still happen at 25 mph speeds. There might be really simple things that could be done with timing of stoplights to give pedestrians more of a free flow of passage downtown. I know that the Main/William intersection has a delayed green that gives people a few extra free seconds to cross the street before the light turns. Setting up something similar on State between William and Huron could possibly be helpful to pedestrians. My opinion is that a crosswalk at 7th and Jefferson would make more sense. Even a flashing signal (RRFB) could be effective. The problem is that 7th and Madison has a major left turn lane and lots of traffic goes through there. Pedestrians could cross at 7th and Jefferson without too many more steps (if they were coming from Madison) and it would be much less interference with what drivers are thinking about. With a range of 0-1, and r-squared a measure of how much of the variance in the data is explained with the line, I think I’ll stick the position expressed in the column: Based on those reports, I don’t think it’s possible to draw conclusions about any impact the current ordinance might have had on safety – good, bad or indifferent. Please see my comment #15. I have been “standing up” for the downtown and campus area by way of advocating for best practices. A few years ago I was labeled a “safety nut” just for asking Ann Arbor City Council and Roger Fraser to follow best practices. Our P.E.’s know what best practices are and can evaluate which improvements would have the greatest impact on pedestrian safety. However, the P.E.’s have been silenced. Why? Ask about funding for transportation planning (trains, connector, etc,) and the answer will be a list of funding options. Ask about funding for pedestrian safety infrastructure and the immediate answer is we do not have the money. Downtown parking revenue takes priority over abiding by the state law that prohibits parking within 20 ft of a crosswalk. I recommend a P.E. sign off on every transportation-related project, right down to parking space placement. Kathy Griswold, I appreciate your efforts to improve safety. But I wonder: have the PEs (professional engineers) really been silenced? In comment #20, Chuck W explicitly points out that they have said Madison & 7th can’t have a signal because it doesn’t meet standards. I’m confused by various statements (from different sources) I’ve encountered over the years that decisions are made willy-nilly without input from “professional engineers”. From what I’ve read, safety engineers determined the placement of the HAWK on Huron and the flashing beacons on Plymouth. What decisions are being made without their input? Or is it that I don’t know the terminology – maybe it’s not PEs making those decisions, but some other kind of experts? I wonder if the trade-off for increased on-street parking spaces is revenue or DDA/merchants who say “our customers need more parking!” – which, when you dig down into it, usually means (a) on-street, (b) in front of their store, and (c) [if you polled the drivers/parkers] preferably free. re #23 – crosswalk at Jefferson & 7th would definitely help those heading north from Madison. A crosswalk at Princeton & 7th would help those heading south (towards Pioneer). Princeton is more central between Liberty & Pauline (the existing signalized + crosswalked intersections), but adding both seems better that choosing. After all, there is a crosswalk at Snyder & 7th and that is in the much shorter segment from Pauline to Stadium. Re 29: There has been talk of traffic calming on 7th. Two constructed crosswalks with pedestrian refuge islands would definitely have that effect (I like the Princeton idea). I dislike the idea of bumpouts along 7th, partly because these don’t work as advertised (HATE the one at Pearl and Brooks) and partly because it would interfere with the bike lane. But a couple of central pedestrian islands might have a similar effect. As an aside, the emphasis in this discussion on “PE’s” seems like a bit of a red herring. As far as I know, some of the city’s engineering staff are PE’s and some aren’t, but I’m sure they’re all competent. “PE” in engineering is not like “MD” in medicine; it’s an impressive credential, but you can be a perfectly competent professional engineer without being a Professional Engineer, and in fact in many areas of engineering it’s not an especially important thing. It’s true that PE status is important in civil engineering, and many traffic engineers are PE’s, but what’s important here is the fact that they’re traffic experts, not PE’s. Transportation planners also have expertise here, and most of them aren’t engineers at all. Is that not already the case? I confess that I don’t see anything in your illustration to alter my point. One picture appears to leave a little lane for bicycles, at the cost of forcing traffic to stop in each direction before weaving around the obstacles. I don’t see how we can in good conscience suggest that a major connector roadway should have obstacles that actually stop the flow of traffic to this extent. I’d rather see more signalized cross-walks and consistent traffic enforcement. One effect of the traffic calming on Brooks (according to some of the neighborhood emails) has been increased anger and impatience on the part of drivers, so that they speed in between bumps, etc. I really hate that bump-out because it requires me to guess whether oncoming traffic will make way or not (it requires northbound traffic to veer into the parking lane to make it work as a 2-lane road). Often I have to stop and just wait (you should watch the buses try to maneuver around it). We should not turn traffic regulation into a war between modes of travel or between neighborhoods and those who must pass through. Reasonable accommodation to all should be the goal. An additional success note: I’ve been pleased to see how the reconstructed Miller has added a sidewalk along one side and also several pedestrian refuge islands. I assume that road stripes and signage will make these into full-bore pedestrian crossings. @34: I’ve seen them elsewhere as well and they work fine for drivers and bikes.. This blog post has better pictures. I guess you missed the point Kathy which is that the current messed up transportation system that neglected pedestrian and biker safety in favor of allowing cars to go wherever possible as quickly as possible was a product of the “expertise” of P.E.s. Having learned the hard way, the “non-experts” aren’t willing to cede the decision-making to the “experts”. As a bicyclist, pedestrian and driver, I appreciate anything that slows the traffic down here. I have lost track of the number of times I’ve nearly been nailed as a pedestrian at marked intersections by drivers too anxious to make their “right turn on red” to wait for me to cross. As a cyclist even when I place myself directly behind the car to make my right turn (as I would as a driver on a non-bike lane road), cars pull ahead of me in the turn and cut me off. Perhaps there should be a total “No Right on Red” law in A2 too – seems that the drivers’ need to make that right turn at all costs is another big part of the problem.